Clackamas County's Veterans Village -- a transitional shelter community for homeless veterans — is showing tremendous signs of success just months after opening in the urban unincorporated Clackamas area. The Veterans Village is made up of 15 small wooden pods that resemble tiny homes, each with one small bed and closet space. The pods have no electricity, running water or heat, but they do have battery-powered lights for reading. Residents share a communal kitchen and shower area toward the front of the property. The goal of the innovative project is to provide decent, safe and sanitary shelter for the county's homeless veterans so they can transition to being self-sufficient. Each resident gets to stay in their own pod, can access the shared community spaces and can take advantage of needed services. After nearly two years of efforts by county staff, nonprofits, businesses, volunteers and others, homeless veterans started moving into the village on Oct. 4, 2018. 1. Two individuals who entered the village already have transitioned into permanent housing. These transitions were made through the county's Social Services housing programs. 2. Two other people have secured employment since becoming residents. Three others are pursuing potential employment with a local fire department after being approached by a representative. 3. Two others who previously relied on emergency medicine now have established primary care physicians and have regular medical visits. 4. One individual has enrolled in classes at Clackamas Community College. "The village is working exactly as designed, and doing so very successfully," said Clackamas County Housing Policy Coordinator Vahid Brown. "This success is happening more quickly than anticipated. I cannot say enough about the good work of Do Good Multnomah, which operates the site for us." The establishment of the village also has potentially saved lives. Since moving in, three residents experienced extremely serious and urgent health problems, necessitating emergency services to rush to the scene. If these veterans had been on the streets — away from this new community — each would have risked death. One key aspect to the Veterans Village project is that the vets can access needed services on site. - Goodwill Jobs, which connects participants to employment opportunities. 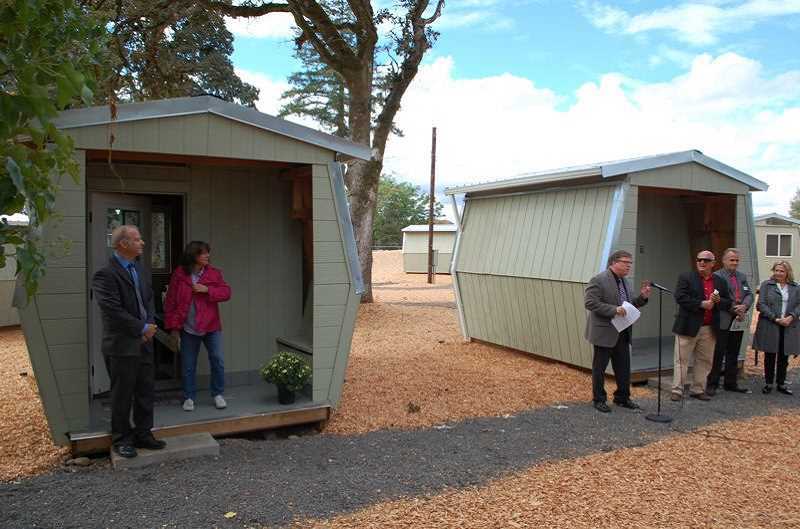 "This is a great success thus far, but Clackamas County is taking a holistic approach to the housing challenges that all of our residents face," said Clackamas County administrator Don Krupp. "We are committed to doing what we can so that all of our residents have access to safe, affordable housing." Commissioner Paul Savas, an early supporter of the project, linked this early result to the Board of County Commissioners' goals. "We have a goal to end veteran homelessness in the county by the end of 2019," Savas said. "This is good news and a great example toward achieving that goal." More on the project can be found at bit.ly/ClackCoVetVillage. —Raymond Rendleman contributed to this story.